I stepped into the Bandra Notun Palli Durga Puja this afternoon and was greeted by smiling faces. “Where were you last year?” I was asked. Then I remembered that we were in Italy last year during the pujos and not in Mumbai. I had forgotten this but the folks at the Bandra Pujo remembered. Any wonder that the Bandra Pujo feels like home for me? to learn how to cook nice dishes." Bandra is the suburb of Mumbai which has been my home for more than a decade and a half ever since I moved into the city. Durga Pujo, of course, is the most important festival for us Bengalis. I’ve been visiting the Bandra Notun Palli Durga Pujo ever since I moved into Mumbai. It always felt like home. A few years back, thanks to a blog post on the pujo, I got to know the organisers of the puja, when they read the post and reached out to me. I came the pujo and met them and got to know that they are Mumbai based Bengalis, who have grown up with the pujo. The Bandra Pujo folks welcomed me as one of their own just as everyone else in Bandra had too. It is a very 'ghoroa' or homely puja as the organisers and their families are pretty hands on in arranging the puja. In the Uk in the 1970s, my parents were part of a such a group too. What is this bhog all about? This time my mother is visiting us from Kolkata, and she joined me to have bhog at the Bandra Pujo. Around 7,700 people were fed today by the hard working volunteers of the Notun Palli Pujo. The age group of battalion working with Kaushik Saha, who heads the food committee, ranges from 4 year olds to octogenarians. The crowds were larger than usual as it is Ashtami, the biggest day of the pujas, and a Sunday too. The food was cooked by Chef Gobindo, as he has for the last 30 odd years for the Durga Pujo here. And for the Lokhi Pujo, Kali Pujo and Saraswati Pujo too. 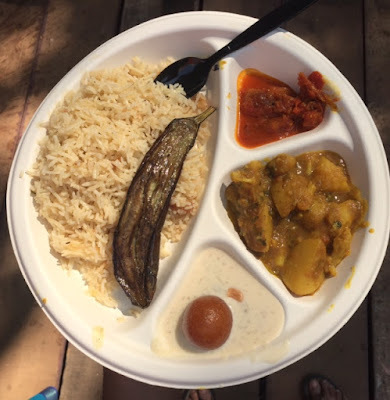 The Durga Pujo bhog is a bit like a Langar in a Sikh Gurudwara. It is served to all who drop in at community pujas such as the Bandra pujo regardless of caste, community and creed. You can come around 1 pm tomorrow and day after too if you want to try it. In most cases it is served free. Ashtami, like I said, is the main day of the Pujo and many Bengalis turn vegetarian for this day. The loyalties of people on this day is split between giving anjali (prayers) and eating bhog. Guess which of these I try not to miss! In Bandra, the ashtami bhog is always centred around pulao and not the traditional khichuri. As apparently it is in pujos in Hyderabad and Gurgaon, and many other places, according to reader comments that I received when I put up the pictures up on social media. The rest of the menu this afternoon was begoon bhaja, alu fulkopir dalna, chaatnee, payesh and pantua. The food tasted good and felt special. It finally felt like the pujos finally. I had dropped in for a short while at the pujo last evening too with my mother and K. Now, it is apparently my time to take my mom out unlike when I was a child when it was the other way round. The moment we entered the pujo yesterday, I was engulfed by the aromas of the streets of Kolkata. Nostalgic whiffs of fish fry, egg rolls, Moghlai parathas and veg, fish and mutton chops being fried and, a rare sight in Mumbai, a bag of phuchkas. I didn’t try any of this as I had a cold and a body ache, and deep fried food didn't seem to be a good idea. The only other times I was under the weather during the pujos was once in high school and once in college. Hurt more then as pujos literally was the crux of my year then. My life has expanded since then and, this time, thankfully I don't have an actual fever. So we stepped out and I had the lovely hot chocolate (highly recommended by my mom in law and me) at Starbucks, and, as per K’s suggestion, a heart warming alu cheese raste ka toast sandwich opposite Theobroma. We went to the Ram Krishna Mission pujo too last evening as mom was on a pandal hopping mood. There were food stalls there as well, though the vibe here was more serene. The food stalls here seemed to be more ‘home chef’ rather than caterer run. In the middle of young boys playing classical music inside and monks walking around outside, I heard a gentleman scream with glee outside a stall to his family, “Ekhane aai, daroon jibe goja” (come here for some lovely sweets). Which got me thinking, what is the spirit of pujos for us Bengalis? On the social media feeds of people I have seen pictures of the Goddess, the puja decorations and crowds (if in Kolkata especially), family and friend bonding, pandal hopping, the purut moshai (priest), dhunochi nach, the onjoli, new clothes, adda sessions, cultural programmes and food, food and more food. To paraphrase my aunt’s childhood friend, Apala, for many of us the Pujos are about connecting with one’s roots. Specially for those of us who don’t live in Bengal. Of course, it’s all about segmentation as I remembered from my market research days and as I later through Buddhism, each individual is unique and should be treasured. So there can't be a one size fits all answer. For some the pujos are about family, for some culture. For some it’s a time to get a break from work or from studies. For others, from caterers to pujo barshiki novelists of yore, to food bloggers today (ahem), it is an opportunity to cash in some extra work. Then there is decking up in notun jaamas and little pandals romances too. And there is the religious aspect of course. As for me, like always, it is the Durga Pujo food that nourishes the roots. Pujo bhog food is usually on the house and is paid for by contributions from the organisers, locals and sponsors. It’s heavy food with ghee and stuff is carb loaded so don’t pile your plate as you might end up wasting some of it as I have learnt over the years. The pujos often have stall selling Bengali food ingredients, saris, ornaments etc.